Isn’t it lovely when the smallest thing inspires you? I found this gorgeous copy of one of my favourite novels of all time (I mean, which literature student doesn’t love Gatsby?) in a local bookstore and it’s just one of those small things that made me so incredibly happy. There’s a whole collection of covers with lots of F Scott Fitzgerald’s works but they’re also quite pricey, so I chose my favourite for the time being! After spending an evening reading, I was suddenly inspired to go through my makeup stash and put together a look that feels sophisticated and oozes glamour whilst still being wearable for everyday (after all, party season is over for a little while – at least for me). 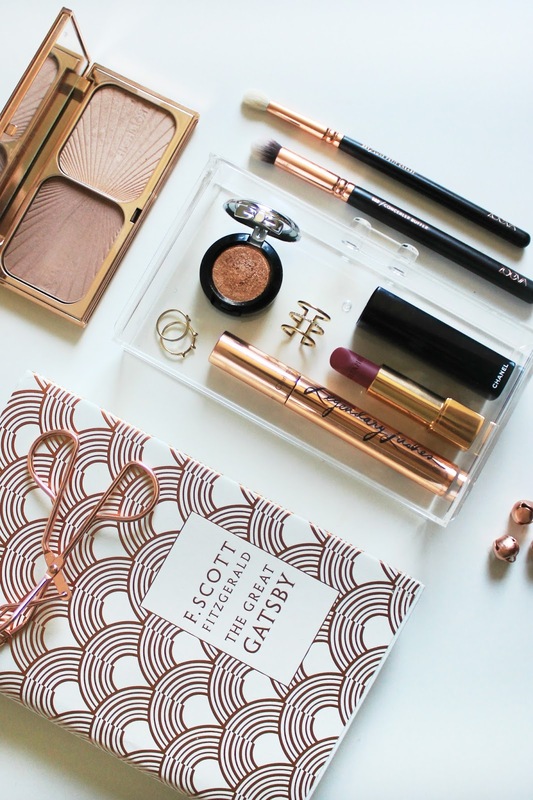 Of course Charlotte Tilbury is a one stop shop for anything classy and glamourous. Her packaging alone makes any makeup addict swoon and the quality of her products make them well worth the extra money. The Charlotte Tilbury Filmstar Bronze & Glow Compact is the perfect compact for sculpting, whether you want to keep it subtle or if you want to build it up for something a little more intense. I’m also all about lots of lash – the more the better – so you might remember the post I wrote last year dedicated to the Legendary Lashes mascara too. It’s still one of the most gorgeous mascaras I’ve ever tried and I’m already on my second tube. It’s on the clumpier side, but the good kind of clumpy… and I love it. Perfect for this effortlessly vintage-inspired look. For eyes, the NYX Prismatic Eyeshadow in Liquid Gold packs a stunning amount of bright golden pigment which lasts really well. I like to use a basic dark matte brown shadow in my crease and then blend this gold all across my lid for a gilded metallic eye that is still well defined. What’s more, if you use it with a damp brush, the sparkle is even stronger… and I’m all over that. In terms of lips, the Chanel Rouge Allure Lipstick in L’Amoureuse is perfect for that in-between plum and rose shade that screams all things Gatsby. It’s a really classy colour and I haven’t come across anything quite like it – it completes the look so well! So these are the beauty bits that I’ve been reaching for over the past few days and it’s all because of a book cover. I do love it when that happens though – and it’s encouraged me to switch up my everyday makeup look and try something new. What makeup bits have you been enjoying recently?